Sam Middelton was born in 1927 in New York City. 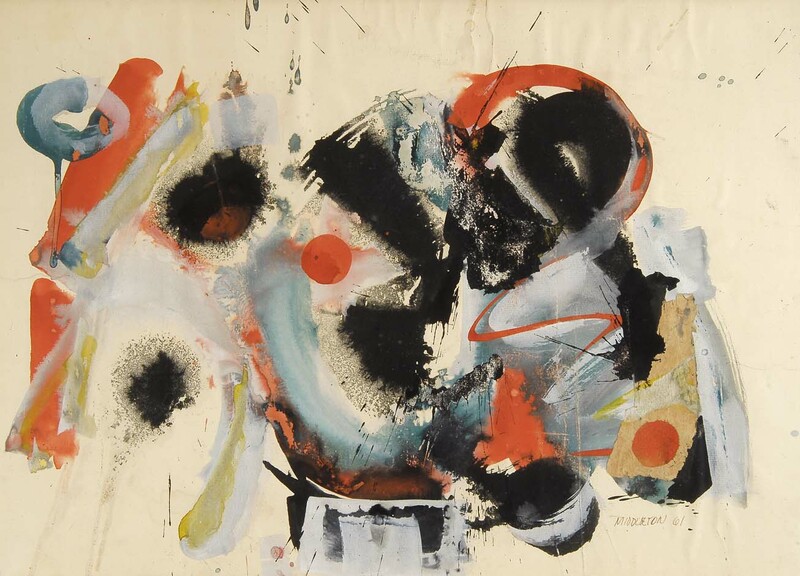 Although he is an African American, he is considered one of the leading Dutch abstract modern painters. He has lived in Amsterdam since 1962. A world renowned artist who has exhibited around the world. Ms. Dumas is a white South African painter who specializes in painting black people. She starts from her own experience. ” A lot of me is Afrikan, I don’t have experience of life in the ghetto, or being in prison, or living in the bush. That’s why I won’t paint that.” Indeed, the race of many of her portrait heads is deliberately ambiguous, highlighting volatile and unpredictable emotional states from aggressiveness to extreme passivity. (See John Haber’s article on Ms. Dumas on our Art Today page.) ed. Elizabeth Sheppell of the Sander/Hudson gallery, Atlanta, Georgia, loves the physicality of painting, and the process that defines it. Loose shapes repeat and tie one another. The works can be quiet and airy–sometimes complex and charged. Mr. Harris is also a collage artist. He considers collage as the same building, adding, and taking away of mental blocks, in order to get to the essentials of what one is looking for. He uses the same process in his writing. ENTER THE SCREAMING ROOM. Collage by Jerry Harris. Courtesy of the if Art Gallery, Columbia, South, Carolina. BAWA BARKING NEWS, bark bark. The distinguished African American sculptor Richard Hunt was presented with the 2009 lifetime achievement in Contemporary Sculpture Award from the International Sculpture Center. He joins the ranks of Sir. Anthony Caro, Elizabeth Catlett, Eduardo Chilida, and Magdalena Abakanowicz, amongst others. I had the pleasure of meeting Mr. Hunt last May at his imposing studio in Lincoln Park, Chicago. He was kind and gracious. Later, we both attended the opening of the 360 million dollar New Wing of the Art Institute of Chicago (May 15, 2009). The new addition to this august institution was designed by the architect Piano. Well, folks we made it to the new year. The art world is buzzing with new work and new media. Let's all hail the internet this year. If this is not the breakthrough that we all have been waiting on, then what is? Do Young Black Artists Need Mentors? There's a lot of talk these days about role models. Back in the day, mine were Mom, Dad, Grandmother, and various community stalwarts. I believe in role models and young black artists need them. People from poor backgrounds are not normally encouraged to pursue a career in art. "There's no money in it," their parents say. That is true, but those who are strong enough should ignore this advice. If one wants to make money, the appropriate place would be Wall Street. Today, young black artists have a wealth of mentors in the art world, Richard Hunt, Willie Cole, Martin Puryear, Walter Hood, Kara Walker, Lorna Simpson, and Sam Gilliam to name just a few. I will always try to help these up-and-coming young artists. Jerry Harris, Ed. Well folks, just like the school kids, BAWA needs a summer break. We will resume publishing in September. "The Sculpture World of Jerry Harris"
This a one person retrospective of Mr. Harris's work. Harris, managing director of BAWA, will be showing 24 works of sculpture and collages. The Art Foundry Gallery is a leading gallery in Northern California. They represent Richard Hunt, Peter Volkous, and many leading regional artists. The gallery's owner and director is the sculptor Alan Osborne.